The American people have spoken at the polls, and we rejected Romney Economics and the Ryan Budget. No we need to make sure that Congress prioritizes job creation, NOT crippling cuts to healthcare and education. The best way to reduce the deficit is to grow our economy. Cuts to vital services such as Medicare, Medicaid and Head Start will hurt our economy as well as our children, seniors and people with disabilities who count on them. 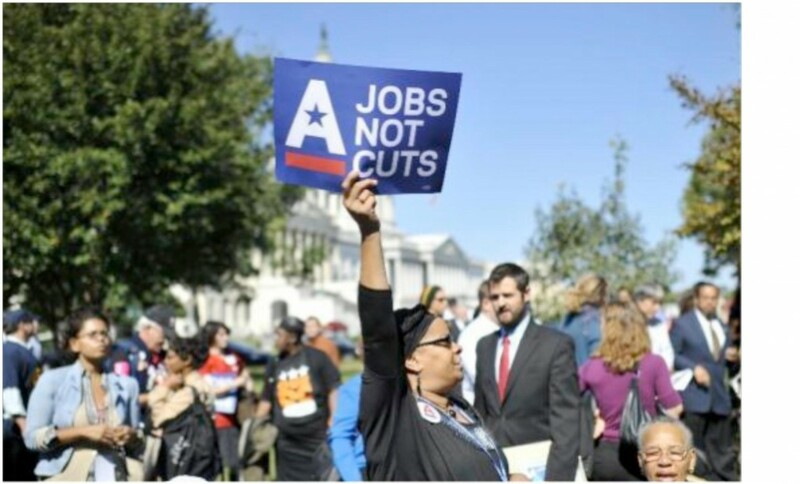 Tell Congress we need JOBS and not CUTS to get our economy going again! Jobs, Not Cuts: What Is At Stake During the Lame Duck Tax-and-Budget Debate for Michigan? Over the next few months, Congress will be facing a set of choices that, depending on the decisions made, will either put people in Michigan back to work or worsen our economic crisis. Much is at stake during the lame duck tax-and-budget debate for the people of Michigan. The sequester will cost Michigan jobs. As a result of the sequester,701 Head Start workers stand to lose their jobs due to cuts in Head Start funding; 536 education jobs will be lost as a result of cuts to Title I Grants, and 387 Special Education jobs will no longer be supported by federal funding. The sequester will reduce vital public services. As a result of the sequester, 3364 fewer children in Michigan will be served by Head Start, 2460 fewer children will receive Child Care and Development Block Grant (CCDBG) services, and 1357 fewer Michigan veterans will be served due to cuts to Veterans Employment and Training. Cuts to Medicaid would hurt Michigan’s economy and threaten quality jobs. If federal Medicaid funding to states was cut by 5%, Michigan would lose an estimated $861,877,000 in potential business activity. These cuts would result in 7,670 job losses in Michigan alone. Cuts to Medicaid would limit access to healthcare for people in Michigan. In Michigan, 1,940,200 people were enrolled in Medicaid in June 2011. Because more than 95% of Medicaid costs are used toward health benefits, even minor cuts to Medicaid would result in loss of benefits, services, and access for the most vulnerable populations, especially in a time when more people are accessing Medicaid. Cuts to Medicaid would result in shortfalls in the Michigan state budget. A 5% cut in federal Medicaid spending would reduce Michigan’s Medicaid budget by an estimated $397,082,000. With state budgets are already overextended, the loss of federal funding will result in a shortfall in the state’s budget, making a slow economic recovery even worse. Proposals to end the Bush-era tax cuts for those making more than $250,000 per year would provide roughly $829 billion in revenue over the next ten years—money that could be used invested to prevent job-killing budget cuts. Ending tax breaks for those making more than $250,000 would affect only 1.3% of people in Michigan.